What stress does the Earth experience when rotation slows and stops? We have mentioned that the core wants to continue to turn, the crust, which has been grabbed by the near presence of Planet X at the Atlantic Rift point, resists, slowing and stopping, and that this conflict causes the Earth to moan. During stoppage, and to a lesser degree during dramatic slowing, the Earths magnetic field continues as before but exhibits distress. Normally, the magnetic field is a particle flow emerging from the N. Pole and circling round to the S. Pole. The presence of Planet X blocks this flow on that side of the Earth, such that the particles shift to flow more strongly on the Far Side, away from Planet X. When Planet X is close enough to cause agitation and spilling over of the ionized particles that normally group at the poles or around the highly magnetized core of the Earth, these particles flow Along Under the crust of the Earth until they find themselves captured at the Atlantic Rift. This creates a conflict within the Earths magnetic field, as it now has yet another magnet to deal with. 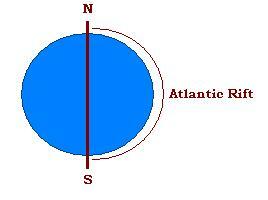 the Atlantic Rift, aligned loosely with the Earth, but due to the bulge of the Equator, not strictly aligned. The distress a highly magnetized Atlantic Rift has on the surging magma is to create an irregular outgo at the N. Pole, where the particles flowing through the core are going straight up and out, but the particles that flowed along the Atlantic Rift are emerging at an angle. Thus, the point where this angular outflow emergence occurs is agitated, due to ionized particles under the crust surface in rapid motion. This is an indication that the Atlantic Rift has become magnetized, has gathered the ionized particles that escaped from their normal domain near the poles or surrounding the core, and that rotation slowing can be anticipated shortly.